Swamp Coolers Are Primitive, Economical, Simple, But Effective! During our journey of hvac design discovery, we have spent time in the world of conventional air conditioning. The Land of Swamp Coolers looms directly ahead. Step on in with me, get your feet wet, we may discover some unknown facts. In the days of old, water soaked blankets were hung around sleeping porches, so folks could be cool at night. The desert breeze would blow through effectively bringing down the nighttime temperatures. Swamp coolers are also known as "Evaporative coolers", which is actually a better name for the units. 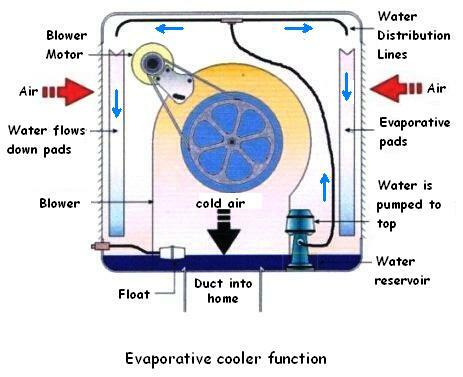 Evaporative cooler better describes how they work. Swamp coolers are economical. They cost approximately 1/3 the cost of a refrigerated air conditioner to install. Operating costs are certainly a consideration, as well, if you are debating the two cooling systems. It is estimated that the electrical consumption of a swamp cooler is about 25% of the electrical consumption of conventional air conditioning, in the average home. I heard that estimate many years ago. I would bet that number is closer to 50%, with the higher efficiencies these days and more home's hvac systems being properly designed. 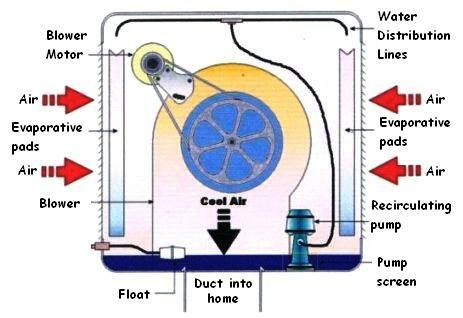 A large blower, or fan, is located inside an enclosure surrounded by pads which are constantly being soaked with water. As fresh, hot outside air is drawn through the pads, the air is cooled by evaporation. Depending upon outside temperature and humidity, the effective drop in temperature can be as high as 25 degrees. Evaporation is a natural phenomenon which is going on around us all the time. We perspire when it's hot, effectively helping to cool our bodies. Have you noticed it is always cooler near streams, lakes, or the ocean. Evaporation is happening as drier air passes over a body of water. The hot dry air is trying to equalize humidity by drawing up and absorbing moisture from the body of water. An evaporative cooler harnesses the results of evaporation and distributes it through duct work to effectively cool your home. Swamp cooler systems are relatively simple. A single large duct usually feeds out the bottom of the unit, down through the roof, and terminates in a single large 4-way register (usually in a central hallway). An evaporative cooler pulls all of it's air from outside, which causes a positive pressure inside the home. For the air to move effectively this pressure must be relieved. Opening a door or window at each end of your home will allow the water laden air to travel. Another effective means of relieving this positive pressure is the installation of UpDux. UpDux are one-way relief ducts installed in the far corners of your rooms. These ducts vent the positive pressure into the attic, allowing air flow across the living space. I think UpDux are a great invention. They only open under a positive pressure situation and they help to cool your attic by displacing hotter attic air. That also means less heat radiating down through your sheetrocked ceiling. If you are considering installation of an evaporative cooler you must know that Swamp coolers do not perform well in humid areas. They are most effective in hot dry climates. Even desert-like regions experience humid days. On those days, just don't expect your cooler to perform well that day! Swamp coolers are popular, not only for their installation and operating costs, but also for their simplicity. The do-it-yourselfer can easily repair and maintain all parts of the cooler. Refer back to the illustration above as we walk through the workings of a swamp cooler. The float in the bottom maintains a reservoir of water in the cooler. The pump moves water from the reservoir up to a piping system which distributes water to each evaporator pad. The blower (fan) pulls air through the water laden pads, cooling the hot outside air. The cooled air is then pumped in through ductwork to cool the residence. The diagram above shows a downdraft unit, which is the most common configuration. Swamp coolers are also available in sidedraft configuration for window mounting, just in case you don't want to poke a hole in your roof. Coolers come in all shapes and sizes. Champion Swamp Coolers are amongst the most popular and economical brands. I have even seen portable units on wheels, which you can move from room to room, much like a portable air conditioner. These you will need to fill manually with water. The roof mount downdraft and the window sidedraft will probably have been installed with a permanent water supply and reservoir float. Coolers are available in many different output ratings from very small up to 6500 cfm (cubic feet per minute) for residential applications. A 6500 cfm cooler moves a lot of air. For a residence I would not recommend any unit larger than a 6500. Larger units than this are commercial units and require 240 volt power supply. And they will probably knock your kids over when they walk down the hall. If your home requires more than 6500 cfm, consider dual units positioned at opposite ends of your home. Sizing your evaporative cooler does not require the aid of a rocket scientist or even an hvac design calculation. Figure up your square footage, times it by your ceiling height, divide that number by 2, and voila the result is the cfm recommended. (Sq. ft x ceiling height) = cubic feet. Then (cubic feet x .5) = cfm required. For a side by side look at the Pros and Cons of both Swamp Coolers and Central Air Conditioning click here.